I am someone who lives in Seaton Village in downtown Toronto and I really enjoy the community aspect of Hallowe’en. I have also been happy to attend some wonderful community events post Hallowe’en such as the Harbord Street pumpkin festival and the Vermont Park and Christie Pits pumpkin patches where there are lovely and creative displays of carved pumpkins, magically lit together in the fall evening. 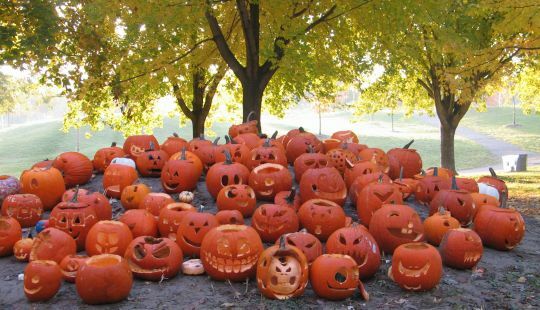 What is really unfortunate about the tradition of pumpkin carving is the waste of food as the vast majority of these pumpkins are destined for destruction. Pumpkin is a highly nutritious vegetable. The seeds and the flesh are packed with vitamins and nutrients. In Britain, they’ve now organized the “Great Hallowe’en Pumpkin Rescue” to encourage pumpkin-eating. There are wonderful pumpkin recipes around and pumpkin actually is very tasty. True some pumpkins are less tasty when they get very large, but there are ways to use them, for example in soup, muffins or loaves and pancakes, that are really delicious (as well as nutritious). I have been doing it for years with some very large pumpkins after displaying them for Hallowe’en, carved and lit. I simply cut away the very inside part of the flesh which is burned from the candle and then cut it up into pieces for cooking. I cook the seeds as well. There are also ways to freeze the pumpkin for future use in the months ahead. It is such a waste to use food for fun and then toss it! It is so typical of our wasteful culture. Please consider using your pumpkin for food after Hallowe’en! Here are some recipes for cooking pumpkin and pumpkin seeds. I will add more as I come across them! To cook pumpkin, I use the microwave to save time. Pierce the skin and put in a pyrex casserole dish. 2 cups worth takes about 15 minutes but it depends on the microwave of course. Melt butter in large saucepan over medium high heat. Mix in flour and curry powder. Cook until bubbly, about 2 minutes. Remove from heat and gradually stir in stock. Add pumpkin, salt, brown sugar, pepper and nutmeg. Cook over medium heat, stirring until thickened. Use hand blender to blend smooth (optional). Add milk if wanted and cook until warmed, not boiled. If you want to freeze this, freeze without the milk. Ladle into bowls and garnish with dollop of yoghurt and chutney if wanted. Cream the butter and sugar together in bowl. Beat in eggs (one at a time) until smooth and then stir in pumpkin. In another bowl combine rest of dry ingredients. Mix and pour into pumpkin mixture and stir until moistened. Spoon into greased 9 x 5 x 3 inch loaf pan. Bake in preheated 350F oven for 1 hour until it tests done with a toothpick. Let cool for 10 minutes and then turn out to cool on a rack and wrap. Combine first eight dry ingredients. Stir well and make a well in the middle. Beat egg in small bowl until its frothy. Then mix in sugar, oil and pumpkin. Pour into well. Stir only until moistened (leave it lumpy). Fill greased muffin cups 3/4 full. Bake at 400F 20 to 25 minutes. Cool for 5 minutes and remove. Serve warm. Add 1 and 1/2 tbsp of grated orange rind to batter. I did this. It was good. Heat about 1/2 cup oil in a frying pan. Put in 1 large sliced onion with 1/2 tsp of cumin seeds and heat until seeds pop and brown a bit. Add about 3 cups of cubed (bite size) uncooked pumpkin and sauté a few minutes and stir around. Then add 1 tsp chopped ginger, 1 tsp pressed garlic, 1 tsp chili flakes which are mixed together with a bit of salt. I also added some small amount of brown sugar and some grated coconut and a bit of gram masala. I think you could also make it with coconut milk and serve with rice. Add 1-and-1/4 cup of water and cook covered until the pumpkin is soft – about 15 minutes. Rinse the seeds and remove any flesh and drain and pat dry. Put in bowl and add some small amount of vegetable oil (or olive oil). Add seasonings. I use a small amount of salt, cayenne pepper and then whatever you like. Last time I used some Gram Masala and it worked well. Spread on a cookie sheet. Bake in oven on low heat (about 225F) for an hour or so. The slower you bake it, the more nutritious it is as well. We eat the seeds whole.